You can opt for self-transportation or transportation to and from Waikiki hotels and condominiums is also offered. This leisurely drive should take you along the scenic south east coast of Oahu, ,where along the way you'll pass Diamond Head, Kahala, Waialae Country Club, Hanauma Bay, Blow Hole and Sandy Beach. The trip takes about 35 - 40 minutes in morning traffic. Upon arrival at the golf course you'll check in by at least 8:40 am for your 9:10 am tee time. All Green Fees, tees and a power cart is included. 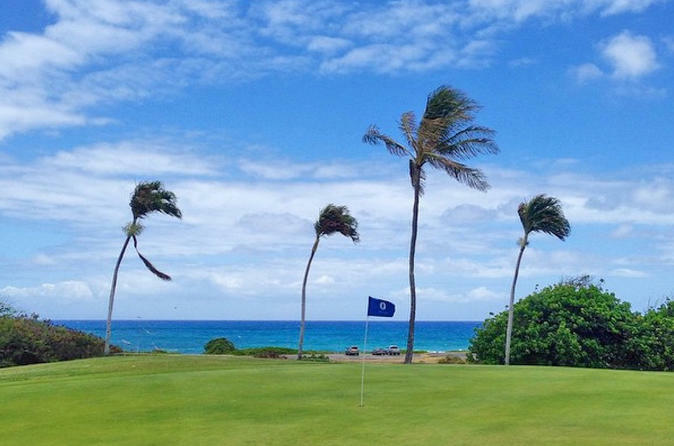 Expect to enjoy the scenic course as your round will last an average of 4 1/2 hours. If you require golf club rentals these can be arranged in advance at a price of $35.00 per set, payable upon check in. Upon completion of your round you can have lunch and/or beverages at the restaurant before heading back Waikiki.